I have had such an amazing time with my friends from Price*s Pimiento Cheese over the past few months showing y’all all the yummy and amazing recipes you can make using their delicious pimiento cheese spread. From the gooey Hot Ham and Pimiento Cheese Sandwich, to the fun and tasty Southern Sheet Pan Nachos, to the tantalizing Pimiento Cheese Deviled Eggs, to those utterly amazing Pimiento Cheese Scalloped Potatoes, it sure has been fun! I’ve got one last trick up my sleeve. 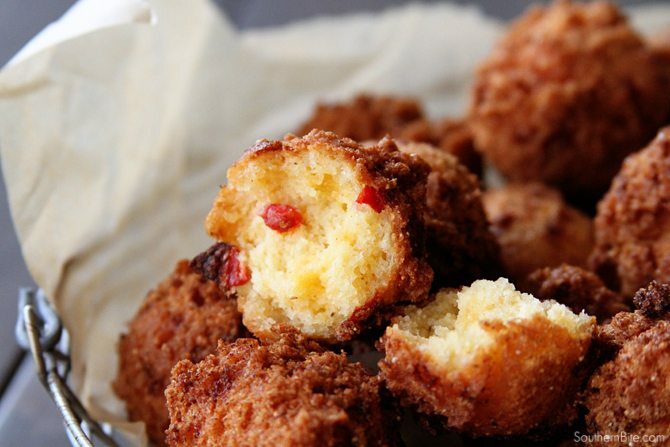 These Pimiento Cheese Hush Puppies. Y’all, they are amazing. Seriously. 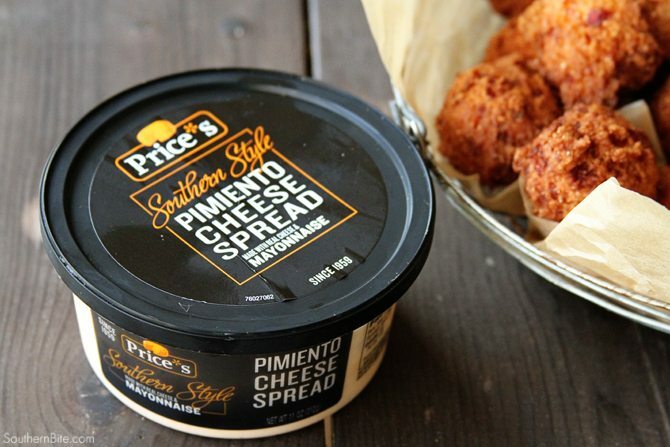 The pimiento cheese spread gives them the perfect pop of flavor and cheesy deliciousness. 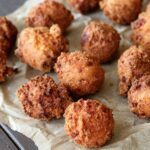 And while I grew up having hush puppies at fish fries and with seafood, they’re seriously perfect for just about any meal you’d serve regular cornbread with. Here’s another idea, too! If you like your hush puppies a little sweeter, You can opt for the Price*s Original Pimiento Cheese Spread rather than the Southern Style. 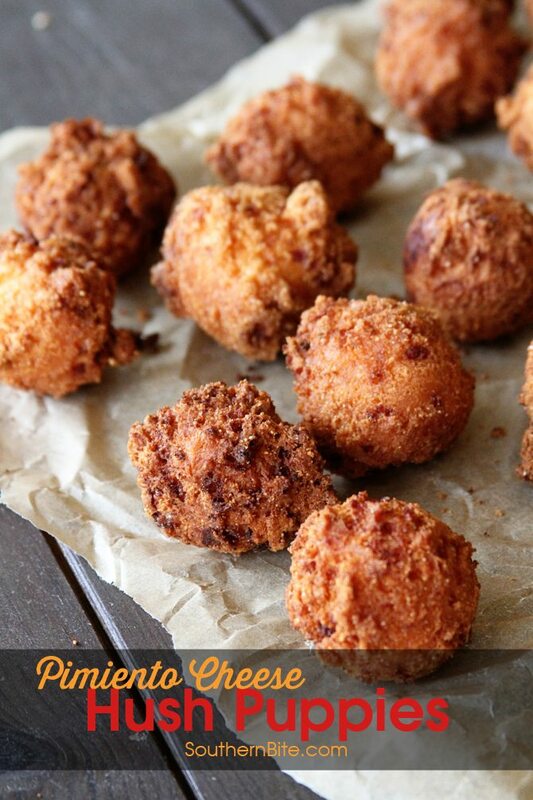 The original is a good bit sweeter so your hush puppy will have a sweeter flavor. It’s totally up to you. They’re both delicious! A few tips: Be sure to fry in batches of no more than 5 or so. Trying to fry too many will result in the oil temp dropping and greasy hush puppies. I usually start by cooking just one to test my oil temp and cook time. I love to use a tablespoon cookie scoop to make the “dropping” process easier. If you don’t have one, dipping a spoon into a glass of water between each hush puppy will help keep the dough from sticking. If you find the hush puppies raw in the middle, try using less dough for each one. Pour 3 to 4 inches of oil into the bottom of a heavy bottomed pot or dutch oven. Heat to the oil 350°F. In a bowl, stir together the cornmeal, flour, and garlic salt. Stir in the buttermilk and egg. Mix to combine. Add the pimiento cheese and mix well. If you like your hush puppies a little sweet, add the original spread rather than the southern style. 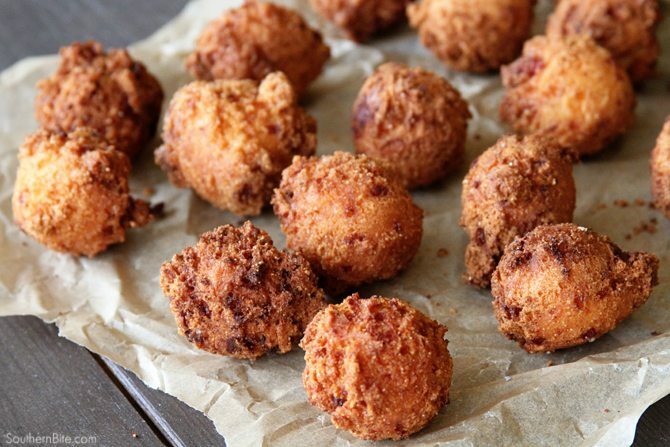 It's a bit sweeter and will give your hush puppies a sweeter flavor. They're great either way. Once the oil is heated, carefully drop by heaping tablespoons full into the oil. Fry for about 3 minutes then flip to the other side. Cook for an additional 3 minutes or until golden brown and cooked through. Drain on paper towels. Be sure to fry in batches of no more than 5 or so. Trying to fry too many will result in the oil temp dropping and greasy hush puppies. I usually start by cooking just one to test my oil temp and cook time. I love to use a tablespoon cookie scoop to make the "dropping" process easier. If you don't have one, dipping a spoon into a glass of water between each hush puppy will help keep the dough from sticking. 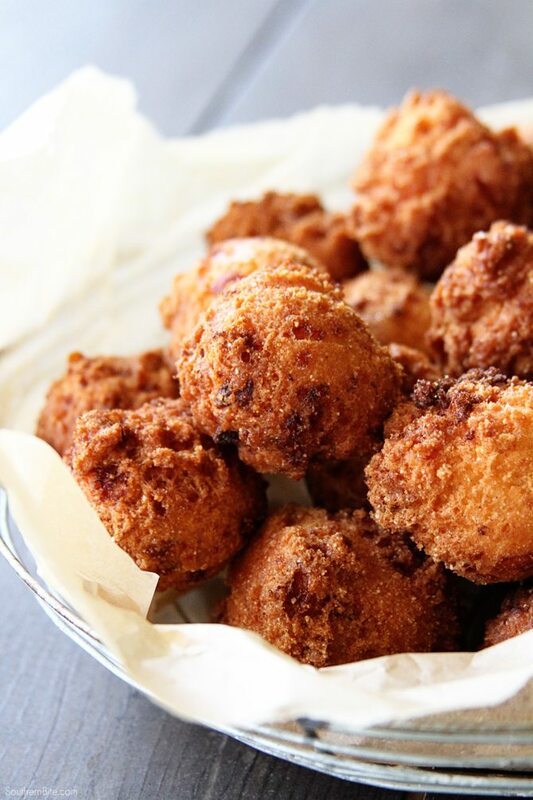 If you find the hush puppies raw in the middle, try using less dough for each one. This post is sponsored by my friends at Price*s Pimiento Cheese Spread but the thoughts and opinions are all my own – just as always. I love Price’s pimento cheese.Thanks Stacy for this recipe.I am going to try it,sounds yummy. Hey Stacey, where can I find Price’s pimento cheese? It’s usually in the grocery store with the other cheese. You can also check out their website to see if they have a product locator. Can I use my own recipe for pimento cheese spread? Would I need to change anything if I do? I think most homemade pimento cheese should work just fine.